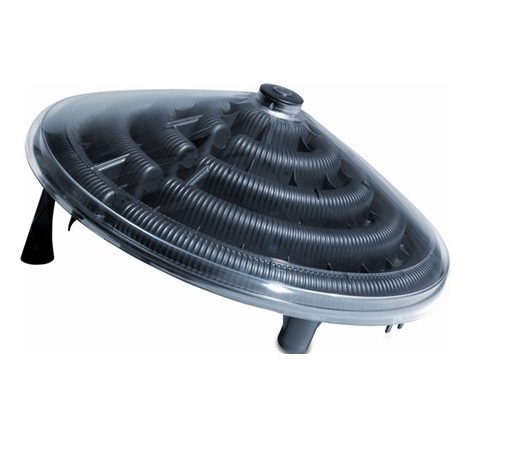 The Sunny brand Solar heater for garden based above ground swimming pools. This solar heater can be used in conjunction with a water pump with 2 cubic metres to 15 cubic metres per hour water flow. The Sunny solar heater can increase water temperature by up to 4ºC with continuous sunshine of 10 hours. One unit is suitable for swimming pools up to 7.5 cubic metres of water. The solar heater is a cheap and very worthwhile way of increasing the water temperature of your swimming pool using the free power of the sun. Connection to the Sunny Solar Heater is via either 32mm or 38mm connection hoses.